In the first month of The Organize & Refine Your Home Challenge we’ve laying down the building blocks of an organized home. So far, we’ve completed our decluttering prep work and put our planning tools & systems into place. 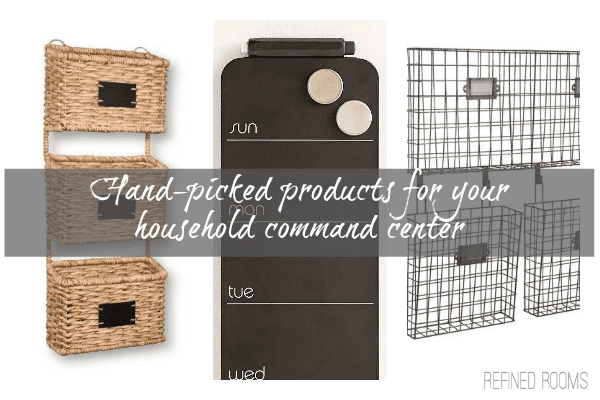 This week, it’s all about creating a household command center. If your home is anything like mine, there’s typically a flurry of activities, paperwork, schedules and household tasks that you’re juggling. 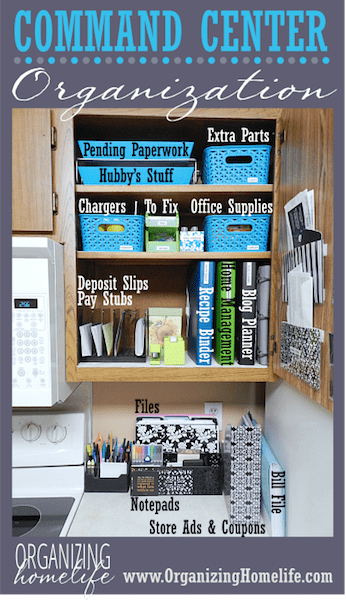 Creating a household command center to serve as the home base for managing it all has been a lifesaver for me. Everyone’s command center will look different, based on the space you have available in your home, how you use the space, and the specific needs of your family. My current command center is a bit unconventional, since it actually consists of three separate areas in my kitchen. I introduced you to my built-in desk area during the Paper Declutter Challenge. 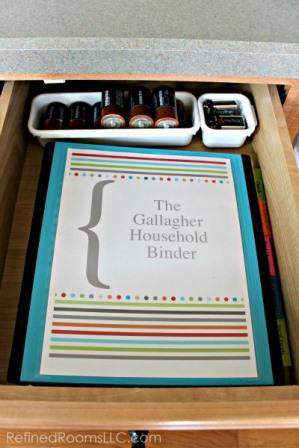 We also keep our household binder in the desk (although I’ve recently relocated it to the back of the action file in order to free up this desk drawer for electronics cords). The binder contains all of our handy reference papers. 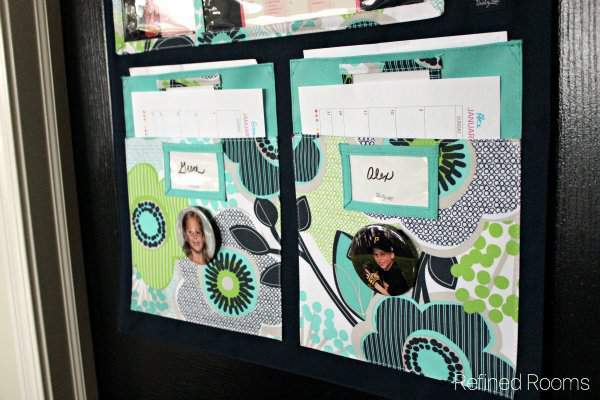 You can read more about the specifics of what we keep in the household reference binder here. 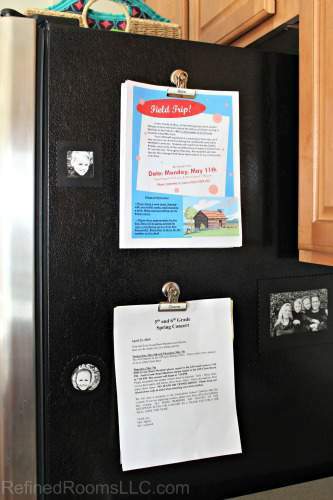 The second command center area in our home is on the side of our refrigerator and consists of time-sensitive school-related papers for each of my kiddos that I place in magnetic clips in chronological order. 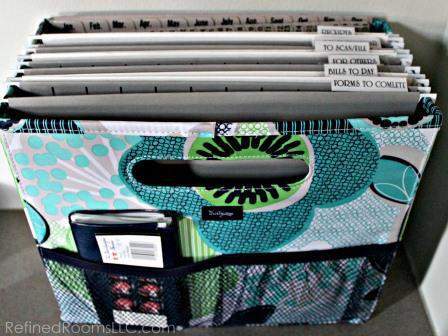 You can read more about how I organize school papers here. The last area of our command center lives on the door in our kitchen that leads into our laundry/mudroom. 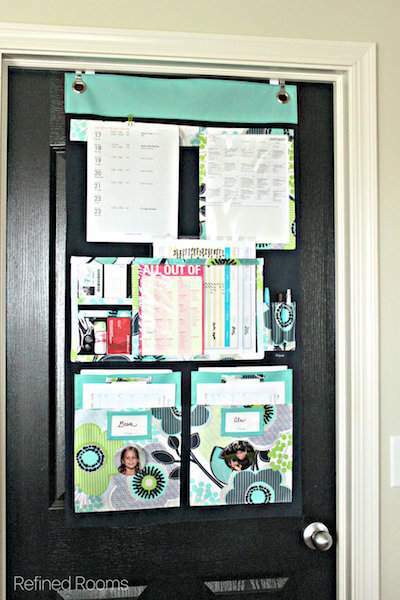 I love my Thirty-One Hang Up Home Organizer! Unfortunately, Thirty-One discontinued this product not too long ago, but if you do a little hunting, you may be able to scoop one up on eBay. Each week, I print out a paper version of my digital calendar that lists the family events for that week (I omit my personal and business-related appointments). 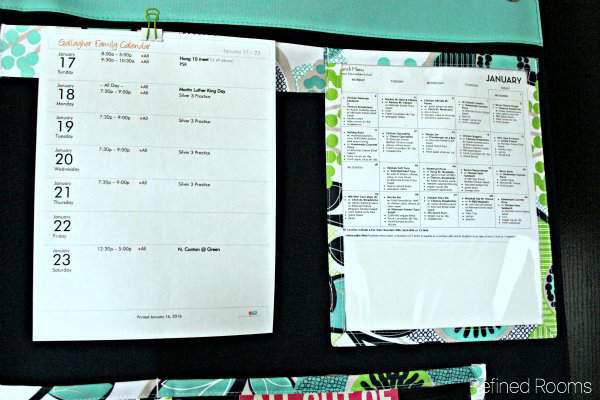 I use the pocket on the upper right to store the monthly school lunch menu. That pocket can be used as a dry erase area, so we’ve got some space on the bottom to write reminder notes (perfect spot, since we view this door each time we’re leaving the house). 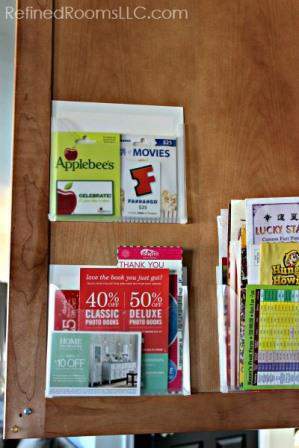 In the middle area of the organizer you can see my husband’s “zone”, where he stores spare business cards, his YMCA membership, and a few other random loyalty cards that he occasionally uses. 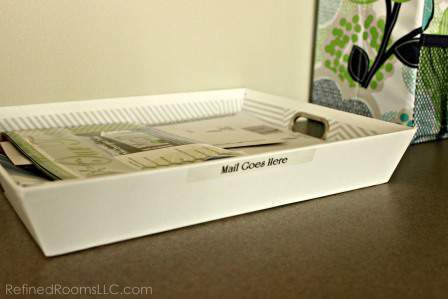 We also store our running shopping list, our pantry and freezer inventories, and a few pens and dry erase markers. Since this door is in between our pantry and our refrigerator, it’s the perfect place to keep track of what food we’re out of and what’s in stock here at Chez Gallagher. The bottom portion of the door organizer contains a pocket for each of my kids. We keep a monthly calendar in each pocket that they use to record upcoming tests and school assignment due dates so that we all know what’s on the academic horizon. Once again, there’s no right or wrong place to create your household command center. Just make sure it’s in a central area of your home. For most people, that central area is the kitchen, but it doesn’t have to be. 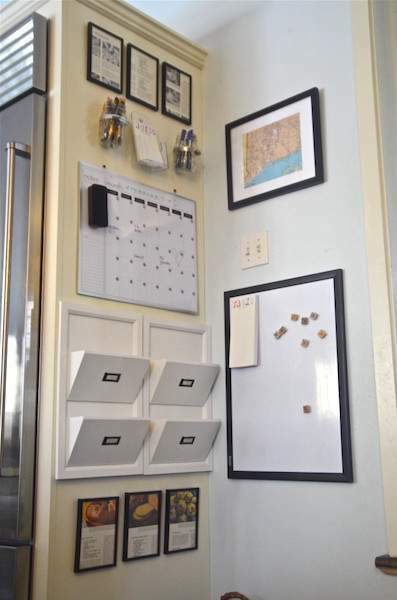 I’d love it if you’d share your household command center on Instagram (use the hashtag #OrganizeandRefineChallenge) and/or share it in the Refined Rooms Facebook community. Let’s inspire and support one another along the way! 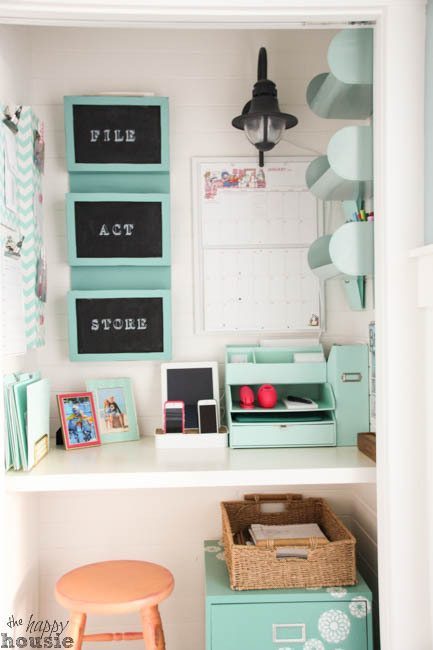 We don’t really have (or need) a command center, because we manage all household paperwork in the home office, and we’re all on one floor, but reading this and seeing your built-in desk made me very nostalgic for a house I used to own. It was quite old, so we had the whole kitchen gutted and my new design included a built in desk that had two deep drawers for filing. I was so proud of that desk! 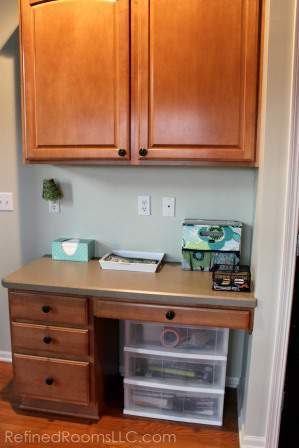 I don’t ever think I’ve seen a built-in kitchen desk with file drawers. That does sound like an awesome “command center”! Command centers can be so pretty and stylish, but also functional. I love that. The pantry pockets are such a great thing, I love mine too! 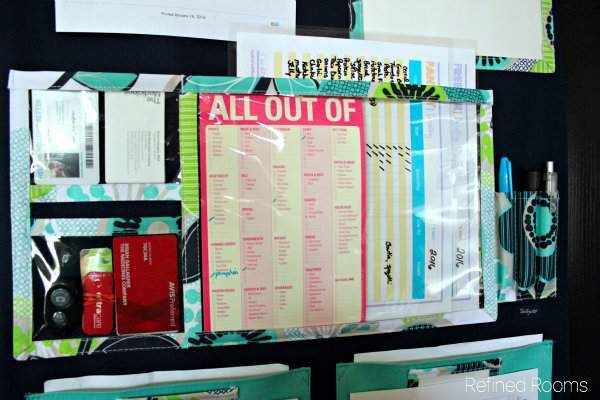 Organizing vertically really does help to save on space. You gave lots of great information, thanks!